Therefore I’d like to introduce myself shortly: I am 23, live in the heart of Switzerland and started sewing about 2 years ago. With my mom and sister I blog at PeterSilie&Co – you are of course welcome to visit us. Just like you, I love to sew vintage sewing patterns. Just sometimes it is really frustrating. It can take forever to recreate a vintage sewing pattern. So, when I spotted this pattern, I knew this would be an easy to sew dress. And because I am ambitious and the dress alone would be to easy to sew, I decided to make a matching jacket. For the jacket I used a pattern, I’ve sewn before from Neuer Schnitt 1962. The dress was quite easy to make. But of course I had to change the darts – they were way to high. And it took some time to pleat the skirt in the perfect way to match with the bodice. Because I made the jacket the second time, I didn’t have to make any changes. Due to the fact, that I wanted to wear the jacket with other dresses as well, the jacket is black. The plaid is only on the inside, so I can always decide, if I want to show the plaid (or not). But my highlight of the look are the belts. At first I thought that it is just a long belt wrapped around the waist several times. Instead the fabric is draped. The instructions were very short (as usual) and I just made them up on the go. And I love, love, love the outcome. (I even wrote a little tutorial: Right now only in German, but if google translator is not working out for you, let me know.) But the blogpost about the dress is now available in english. If you wish to see more swoon worthy pictures, you can hop over to our blog PeterSilie&Co – and yes, the shooting was definitely Audrey Hepburn inspired. I only wish, I would have written more text (to be able to show more photographs). This outfit is my foray into the world of the late teens and early 20’s. I used two patterns from Past Patterns, dated to circa 1920, for both my blouse and skirt, while my purse was made from a tapestry remnant and Vogue #7252, from the year 2000. 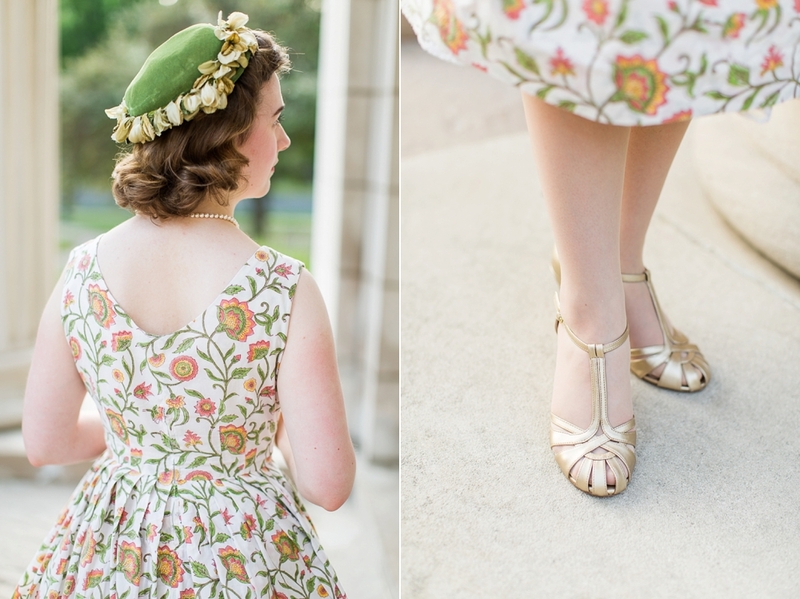 My hat is a thrift store find which I decorated to make-do and my shoes are close reproductions from Jeffrey Campbell. I used primarily cotton for all pieces – even thread! 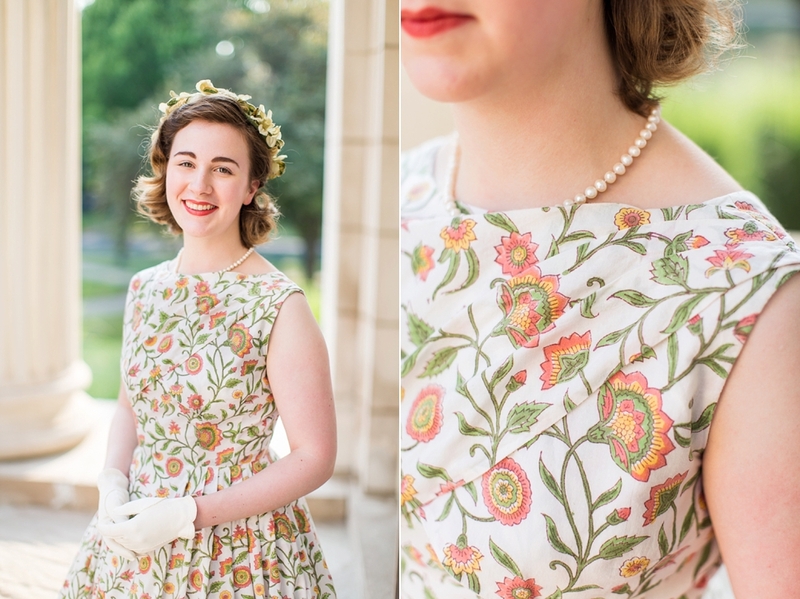 There are so many fine details to this set – the blouse has my hand-stitched floral designs on the neck, shoulders, and sleeves while I used old original glass teens/20’s era buttons for the front closure of the blouse. There are real brass buttons along the pocket panel of the skirt…and check out those awesomely enormous pockets as big as mini suitcases! My background was one of the very first “arcade” indoor shopping malls in our country, a lovely Gothic place built in 1919. To see and read more, please visit my blog post here. In summer I stumbled upon a beautiful and simple pattern for a dress in a 1962 wedding edition of Burda and immediatelly made a few versions of it, including one for a client who loved it as much as I did. The pattern proved very versatile and looks great with a variety of fabrics –no wonder, because it’s just such a simple and staple piece. I really love the short sleeves, they add elegance to an otherwise simple design. I made it with different skirts. I usually freehand them, pinning tucks as I go but I also made one version with a circle skirt that I need to photograph. This is one of my iterations of the pattern: I added a collar with a bow to it. For a moment there I was afraid it looked too much like a hotel personnel outfit! But I guess the bow helps distract the mind from this easy association ;). It’s fully interlined but with no lining. I’m having second thoughts about interlining this one… turned out quite stiff, even though the outer fabric was quite thin. I finished the skirt with a blind hem stich by hand. Check out the original blog post for more photos. On of my most used patterns right now is the Delphine Skirt from the book Love at First Stitch by Tilly Walnes. While I’ve made a few of these skirts in the past, it was the “One Week One Pattern” or #OWOP16 challenge hosted by Cinderellis Sews, that prompted me to make a few new ones. The goal of the challenge was to wear garments made from one pattern of your choice, every day for one week. I already had 4 previously made Delphine skirts, so that meant I only needed 3 more to make. 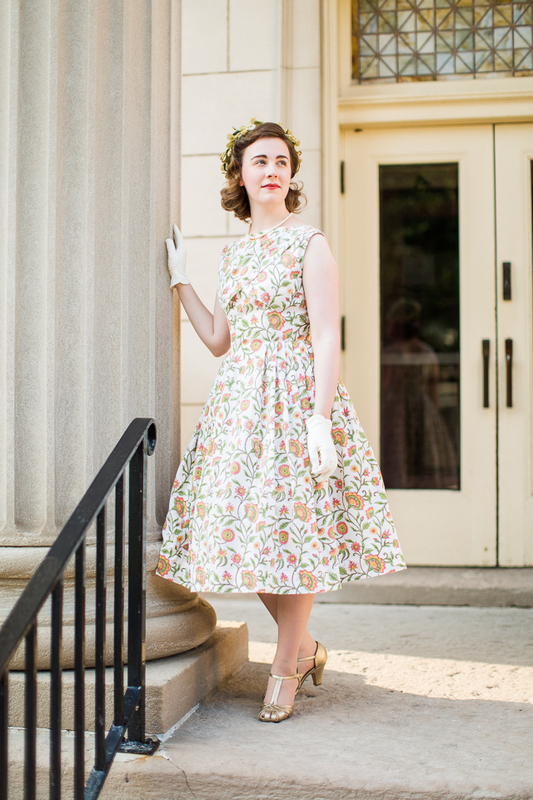 While the Delphine skirt is not exactly a vintage pattern it is retro inspired. The skirt itself has a classic 1960’s A-Line design. In the book Love at First Stitch , Tilly goes over a couple of variations on the skirt. Such as adding buttons to the font. Which is what I did for this nautical inspired version. Since it’s officially autumn I decided that my next two skirts be autumn appropriate. I started first with a brown skirt. I need more brown in my wardrobe. I followed up with a lovely purple skirt made out of a quilted type fabric. For both the brown and purple skirt I added a lining for warmth. I also added belt loops which are an option in the book. Finally I also added pockets, because skirts need pockets. OK, so I’m always waaaay behind trends, and We Sew Retro is case in point! How did I not know about this blog before last week? I’ll never know…. but I’m so glad I finally did! I’m Lily and I’ve been blogging over at Mode de Lis for almost 3 years now and I’m so excited to get in touch with some more vintage seamstresses! 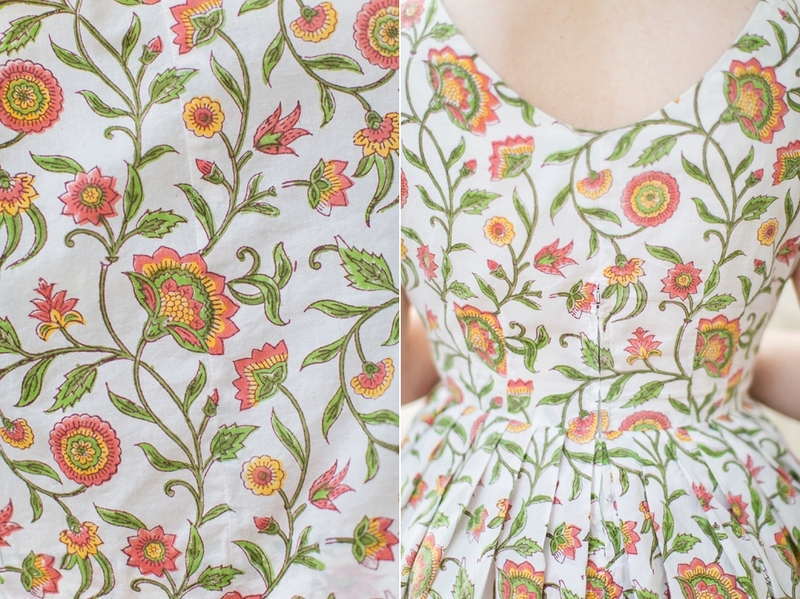 🙂 Last week I shared one of my recent projects: a dress made from hand-printed Indian cotton using vintage Butterick 8083…. More details (including my love for indulging in obsessive pattern matching) over at my blog, Mode de Lis!